The 9V battery provides the needed energy to drive the non-spontaneous process in this electrolytic cell (see figure 1). For my demonstration, I connected the battery and let the cell run for about 30 seconds. There isn't much happening visually. But there is a lot going on! The copper ions in solution are reduced, plating the paperclip in a nice coating of relatively pure copper. 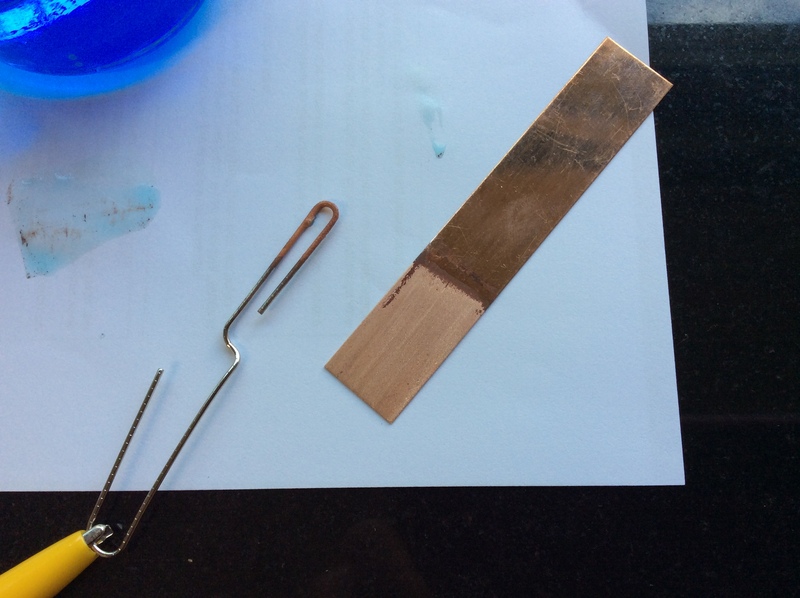 And the copper electrode is being oxidized, thus replacing the copper ions that plate the paperclip. This keeps the concentration of copper ions in solution at a constant level. Figure 2 is a picture of the paperclip with a copper coating and the clean shine of the portion of the copper electrode that was submerged in the solution. I only ran the electrolysis for about 30 seconds, but I'd like to try it for a longer time and see how much copper will plate the paperclip. I've got some milligram balances in my room to put to the test to see if the rate of plating can be calculated also. 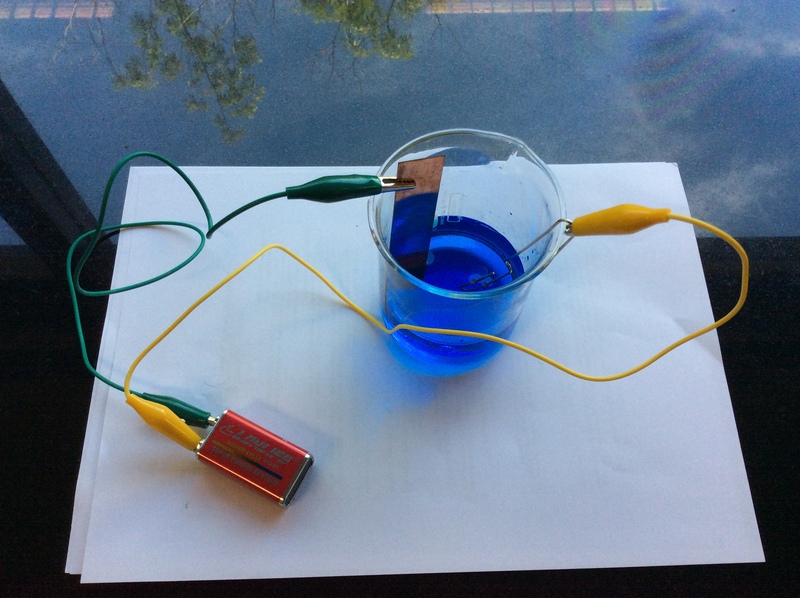 In a scenario where I had a bit more time (and less need to plow through the HL Chemistry curriculum so quickly), I'd like to extend this a bit to have students explore factors that affect the rate of electroplating such as concentration, voltage and temperature of the solution. Do you have any extensions for this demonstration? Or suggestions for additional ways to show students electrolysis? I would love to hear about your use of this or other demos related to electrochemistry. Love this. And it's so simple! Has anyone tried this with less than 1M CuSO4? Will it still work but just maybe take long for the reaction to occurr? Thanks! I haven't tried 1 M CuSO4 yet. Thanks for the question. I have not yet tried usinng different concentrations - and in the IB model the students have a full self-designed lab to complete, so I don't often answer these types of questions explicitly with them. Instead, I prefer to say, "There's a great lab idea there!" I think I might have a student working on this over the next couple months, so I'll report back if there are reasonable results. We teach our kids "OIL RIG", but redox reactions can remain an abstract concept. What a cheap and easy way for students to see the results of redox! Thanks for sharing. Thanks for the positive feedback. Much appreciated. This is an interesting lab in another way also, as the blue color of the solution shouldn't really change much. Copper is being oxidized at the anode, and reduced at the cathode, so the concentration of copper ions in solution remains approximately the same throughout the electroplating. One of my students would like to try this experiment, but with some adaptations. We are looking at Root Killer with copper sulfate instead of lab grade (for budget reasons. Found here: https://www.acehardware.com/departments/plumbing/drain-openers/drain-cle...). My classroom also does not have ventilation other than a window and a fan. I was wondering if there are any safety concerns with inhalation from this project (Can we do this project without a fume hood and will the root killer work as well?). I've been sourcing many chemicals locally to save mone compared to large chemical companies. The consumer Root Killer products are as good or better than lab grade copper(II) sulfate which is typically only 99-99.5% pure anyway. We use the Zep brand Root-Kill for two stoichiometry experiments and 1 spectroscopy experiment and obtain good results. Honest answer: I think it will be alright (to do without a hood), but our scenarios aren't identical. The electroplating didn't produce any gases when I performed the experiment, so I would expect that to be OK. The one variable is the copper II sulfate source. The bottle lists "inert ingredients" as 1% of the composition, but from what I can tell it doesn't list what those ingredients actually are. I'd suggest trying it yourself first with a small amount just to see if there is anything wierd about the reaction. I hope that helps - and that your student has a good experiment!